It is with great sadness that we report the death of Dr Gordon Wright at the age of 101. Dr Wright was a Fellow of Clare College for over six decades, and for many years served as Director of Studies for Medicine and College Tutor. As well as teaching and inspiring generations of Clare students, it was he who was instrumental in the acquisition of Lady de Clare's bell, and arranged for it to be installed in Old Court, where it remains today. 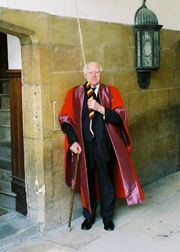 Dr Wright’s funeral was held in Clare College on Wednesday 20th February. Those wishing to make a memorial contribution may do so via the Gordon Wright Fund, which recognises and supports students studying medicine at Clare.